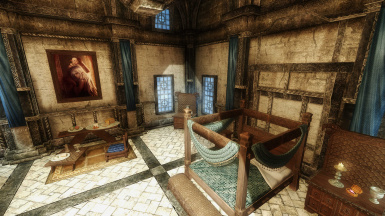 - New HD noble chairs, beds, drapery, Imperial Banners, etc. 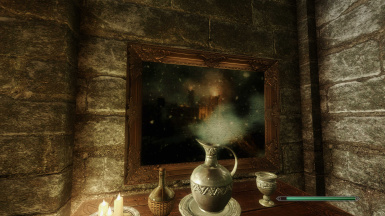 Miscellaneous Patches Required for "Juniper's College of Winterhold - SFCO Patch". 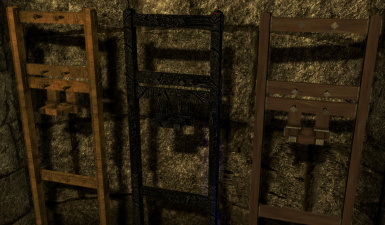 -Tamira, Insanity Sorrow, and Jet4571 for their excellent modders' resources! - Updated the Non-USSEP version of the main plugin to add some missing records. - Included the "No Player Homes" replacer .esp in the installer that was missing. 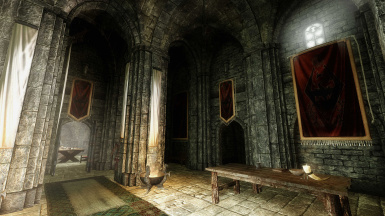 - Updated the patch for "Palaces and Castles Enhanced". - Forwarded USSEP fixes and one conflicting record to the ELFX patch. 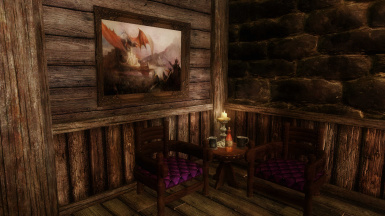 - Rebuilt the Breezehome patch to try and fix a possible CTD issue. 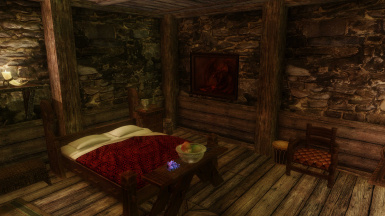 - Converted the "No Player Homes" version to form 44, changed master requirement from USLEEP to USSEP and forwarded USSEP fixes. - Forwarded USSEP fixes to the USSEP version. 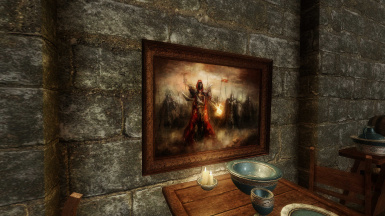 - Removed painting blocking secret passage in Niranye's House in all versions. - Added Interesting NPCs patch to the installer and UPDATES file section. - Fixed errors in the installer preventing some options from installing correctly. - Optimized the installer images to reduce the file size of the installer slightly. 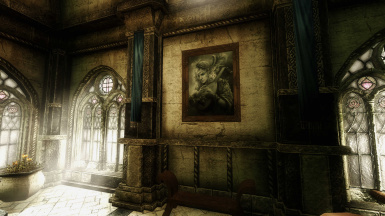 - Added Palaces and Castles Enhanced patch to the installer and UPDATES file section. - Updated most of the patches to fix the form 43 issues. 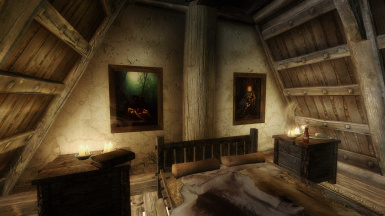 - Also added patches for ELFX and Immersive College of Winterhold to the installer and the UPDATES file section. 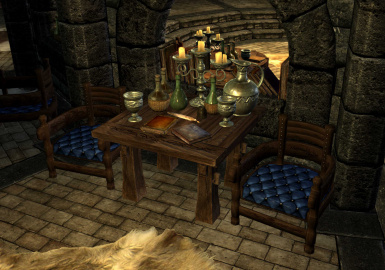 Based on popular demand (and because it will make it much easier and more efficient to update with new content and patches) I present an all-in-one compilation/overhaul of my previous furniture and clutter mods, with many new improvements and additions! 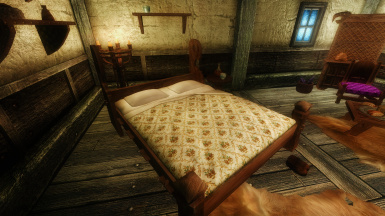 I took some time to clean things up, add content more "Immersively", and add many new cool items and re-textures, including a desaturated version for ENB users, or for anyone who would like these assets to blend in a little more with the bleakish Skyrim environment. 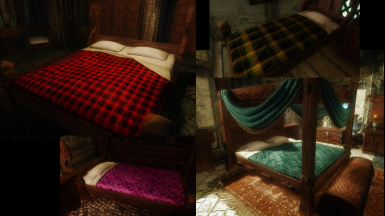 I also created compatibility patches for several of the more common/popular mods that impact the environment. 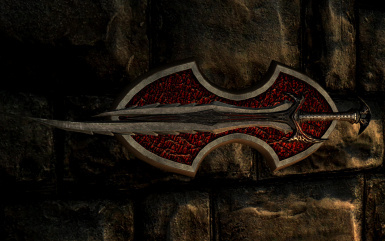 So this looks cool, but what the heck does this mod actually do?? 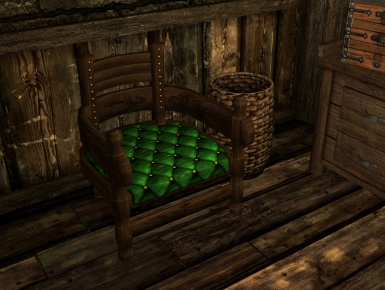 I created/customized new noble chairs and bed meshes. 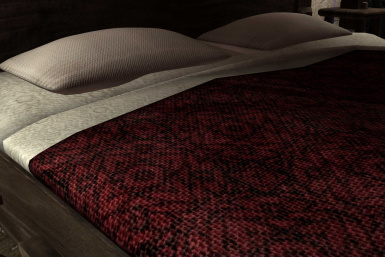 I then created several styles and colors of chair and bed textures (2K res) and hard-coded them to these meshes. 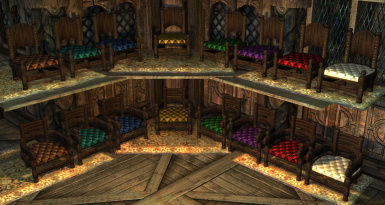 I then went through skyrim cell by cell and replaced most of the noble chairs and beds with my custom ones, choosing colors and styles to best fit the environment. 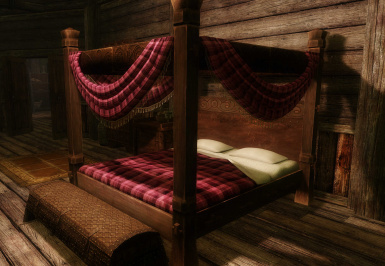 I also set specific styles with the generic skyrim nomenclature to replace any of the chairs and beds that I didn’t change. 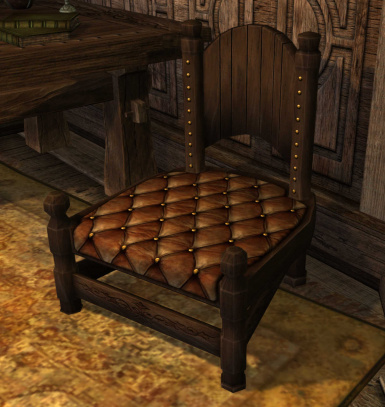 So all noble chairs and beds in skyrim will have one of my new textures, including any added by new mods, as long as they use the generic skyrim nomenclature…noblebedsingle01, noblechair02, etc. I did some mesh improvement work on the vanilla display cases. 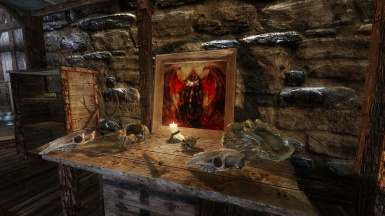 Then I created custom noble, Dwemer, Nordic, and vampire textures for the display cases, as well as weapon racks and plaques. 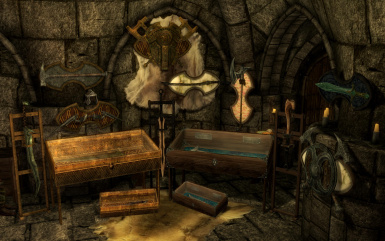 I then replaced most of the display cases and weapon rack/plaques in game with the style that best fit the environment…Dwemer style in Dwemer ruins, Nordic in Nordic ruins, Noble in nicer areas, etc. Some I left as vanilla because they fit the environment better. 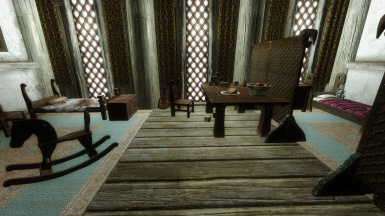 ** The noble chairs, noble display cases and noble weapon racks/plaques were built using the noble furniture texture from NobleSkyrimMod HD-2K by Shutt3r as a base. 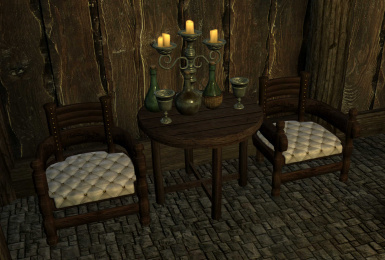 For best results I recommend using at least the noble furniture textures from NobleSkyrimMod HD-2K to cover the rest of your noble furniture in game. 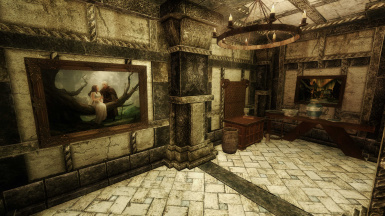 I started with the frames from HQ Paintings (See my credits section) and added collision, environment maps, and a few new textures as well like Dwemer and Nordic. 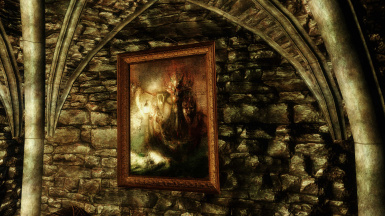 Then I searched for cool artwork that I liked and got permission from the artists to use their work in my mod/s. 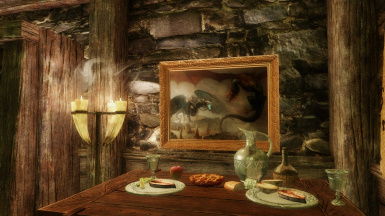 I also collected many Skyrim screenshots. I took these images and modified them to look like paintings, did some cropping/recoloring/reshading, and added canvas and cracking paint textures. 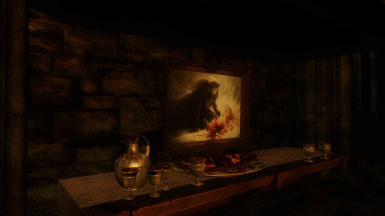 I then created a variety of paintings using these new frames and painting textures, and placed them in nearly ½ of the vanilla and DLC Skyrim cells, with environment theme in mind…dark and forboding in dungeons, playful in kids rooms, naughty in more seedy locations, elegant in palaces, shabby in shacks, etc. 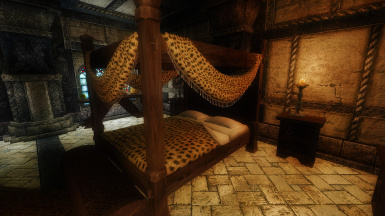 Draperies – I created custom textures for the draperies in Whiterun Dragonsreach and Hall of the Dead. 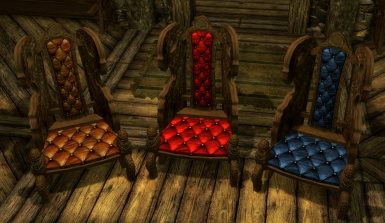 Riften Throne – I created 3 different styles, included the red version in this mod. 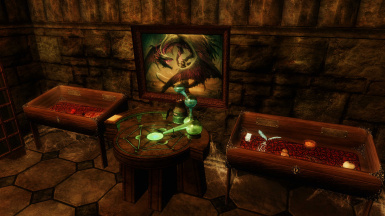 Chidrens’ rooms – I added some additional kids clutter in the childrens’ rooms around skyrim using assets from vanilla game, as well as from Tamira and Insanity Sorrow, with custom textures to some models. 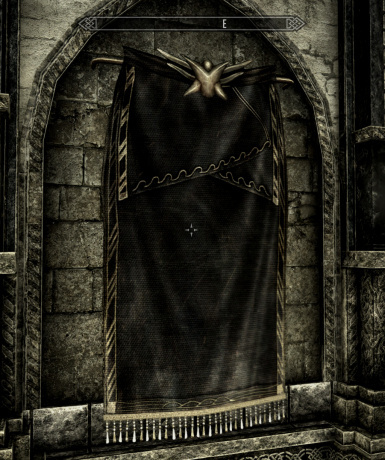 Banners – I added custom textures and animation to Thalmor and Imperial banners. 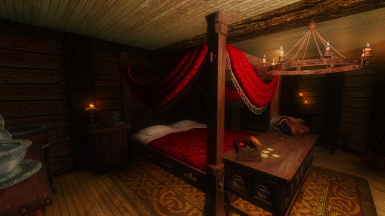 Gutmaw specials – I included a custom Quill of Gemination and Model Ship (TG quest items), bloody rags, and several other misc custom meshes/textures. 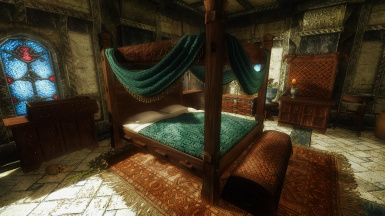 You will want to load the meshes and textures AFTER or overwriting any other mods that replace noble bed/chair/display case/weapon rack and plaque/Imperial and Thalmor banner meshes. 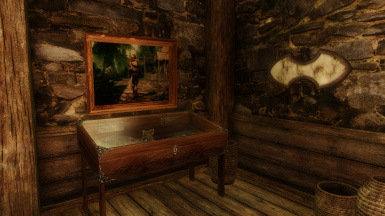 Load Snazzy Furniture and Clutter Overhaul.esp after (or below) Clothing and Clutter Fixes.esp...my mod carries over any changes made by CCF, so it' all good. 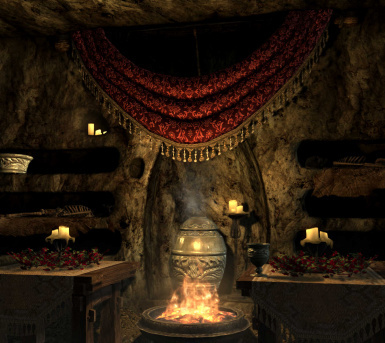 Dawnguard, Hearthfire, and Dragonborn DLCs and USSEP are required for the main plugin (there is also an optional esp available with no USSEP requirement). 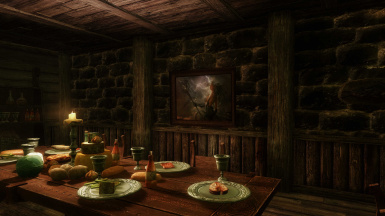 Included are Compatibility Patches for some of the more popular and conflicting mods. I will be looking at other patches as the need arises. Merge the patches based on your your load order. 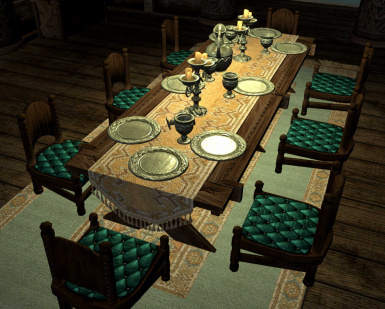 If you have additional mods that change interior cell environment, outside of simple mesh/texture replacers, you'll ofc want to do your own CR patch over these. 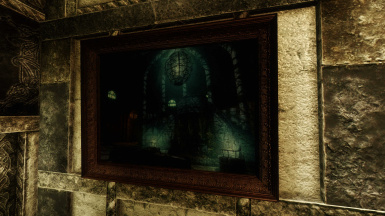 Q: Can I just use the chairs, or the beds, or the Vampire Display cases only from this mod...I don't want to use everything? A: You can install the Replacer version instead of the Mix-n-Match version if you want to choose which of my resources you want to use, Otherwise the Mix-n-match version comes as it is. 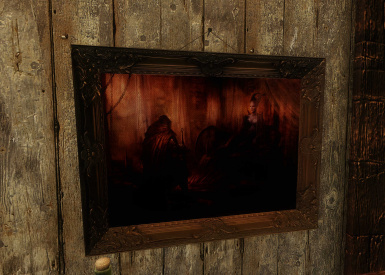 Q: I have paintings floating in the middle of the room? Learn to use XEdit and do your own conflict resolution based on your specific game. I HIGHLY recommend this if you use multiple mods. 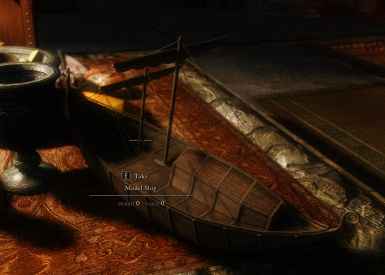 In game, use Jaxonz Positioner (http://www.nexusmods.com/skyrim/mods/52583/?) or console commands to move/delete any of my resources that are out of place. Download my Replacer version. 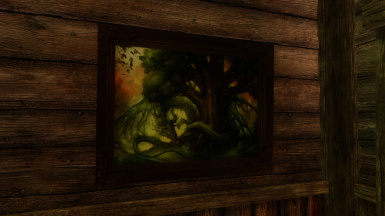 You'll miss out on my paintings, as well as a lot of variety, but still get many of my new meshes/textures. Q: Will you be adding more stuff...I want more, more more?! A: Yep, and will be much easier with this all in one mod! 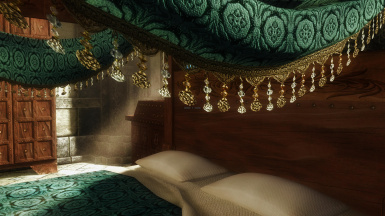 Q: Can I just use the textures I want? A: Yes, use the Replacer Pack found in Main Files sections. Or, just rename the desired mesh (NIF) to match vanilla nomenclature and allow it to overwrite any other mod that may alter those specific meshes. All textures are hardcoded to the mesh, so no need to rename textures. Q: Can you make a patch for "X" mod? A: I'm happy to take a look at creating additional patches, time permitting. Tamira, Insanity Sorrow, and Jet4571 for their excellent modders' resources! 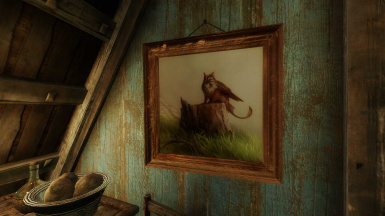 The beautifully detailed frames are edited meshes from HQ Real Paintings Modders Resource by morganmarz, betterbecause, and jet4571 (http://www.nexusmods.com/skyrim/mods/65703/?). Thanks to that team for putting it together and allowing the modding community to share!! 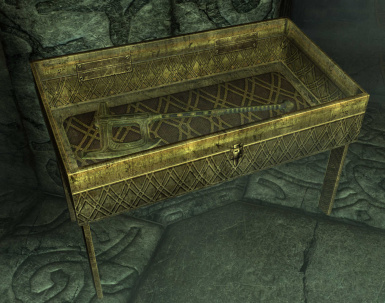 Snazzy Furniture and Clutter Overhaul http://www.nexusmods.com/skyrimspecialedition/mods/2414/? 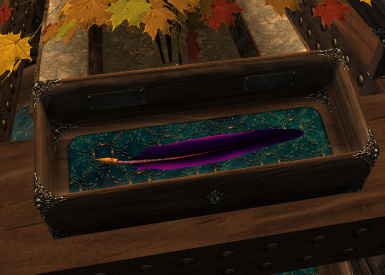 Snazzy Quill of Gemination http://www.nexusmods.com/skyrimspecialedition/mods/4412/? 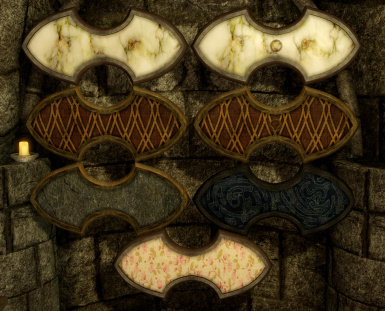 Animated and Improved Thalmor Banners http://www.nexusmods.com/skyrimspecialedition/mods/4413/?